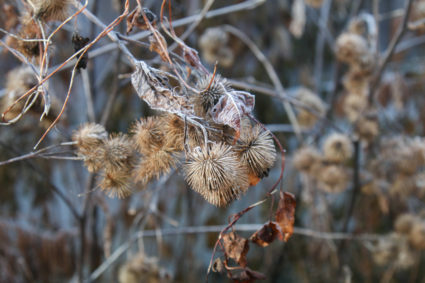 This is a photo blog of my attempt at removing burdock seeds from the sticky seed heads. 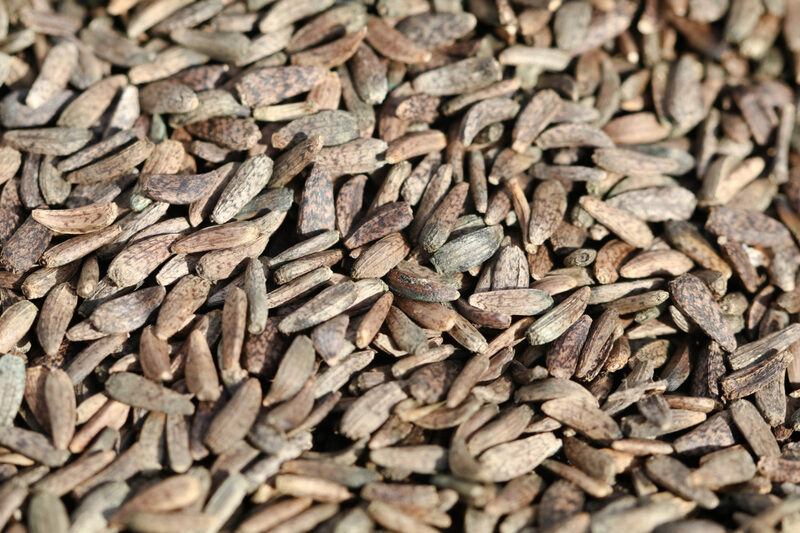 There is also a description of how I plan to use these seeds as medicine. I have wanted to make medicine from them for a while, but was daunted by the task. This year I finally put in the time and here is the process and results. There are two common naturalized species of burdock in the US, Arctium lappa and Arctium minus. They are weedy look-alike often found in sunny disturbed environments. As the species name implies, Arctium minus has smaller flower/seed heads, though the plant itself can be quite large. 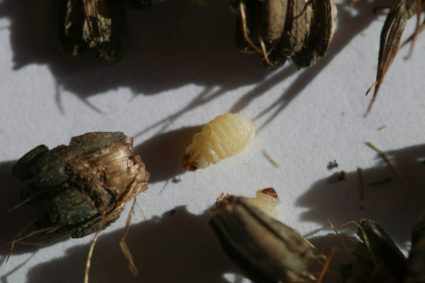 Arctium lappa is the more common species around my home and the one featured in this post. Besides their value as food and medicine both of these plants have the same meddlesome qualities. They have clingy barbs that catch on animal fur, hair and clothing, which helps to distribute the seed heads. The second irksome quality is the hairs. 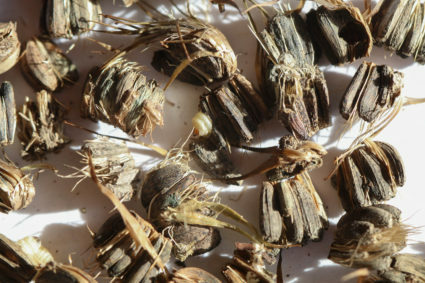 These are initially attached to the top of the seeds but detach easily. They are similar to the hairs of dandelion seeds, though in dandelion the hairs help carry the seeds away. In burdock the small hairs are more likely a means to inhibit predation. The hooked barbs are famous for being the invention of Velcro. 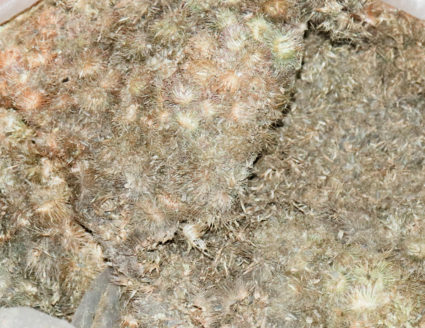 The idea came to George de Mestral in the 1940’s after removing the burs from his dog’s fur. You can read the story here. 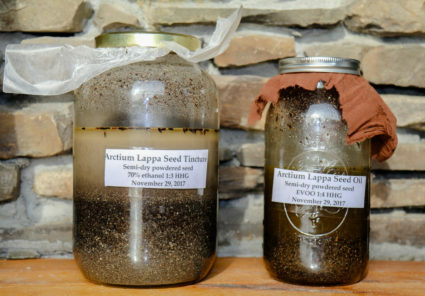 Both species are used interchangeably as medicine, though the roots of A. lappa are more commonly eaten (the source of gobo). There are two fairly easy ways to tell the difference between the two species once they are in flower. The first is that A. minus flower and seed heads are about 1/3 smaller than A. lappa (see photo). And the distinguishing characteristic that I find most helpful is how the seed heads are attached along the flower stalk. In A. minus they are grouped close together, giving a clustered look while on A. lappa each seed head has its own longish stalk. I have used the common terms for the parts of plants throughout this article, but for those interested, here are the accurate botanical terms for the plant parts associated with burdock. Barbs-these are the hooked tips of the involucels. In the Asteraceae, the flower head (inflorescence) is usually surrounded by a group of bracts. These are collectively called the involucre and the individual parts are called involucels. They have various functions. The most famous involucels are those of artichokes, which are fleshy on the inside and tasty when cooked and dipped in butter. Flower/seed head stalk-this is the peduncle, it holds the flower heads and later the seed heads away from the stem. Hairs-the type of hairs described here is called pappus. They are used to distribute the individual fruits. Seed head-this is the infructescence, the part of the plant that contains the mature fruits. Seed-these are technically the fruits. In botany, the fruit is the ripened ovary that contains the seed(s). An acorn is as much a fruit as an apple. The fruits of plants in the Asteraceae (such as burdock) have achenes. 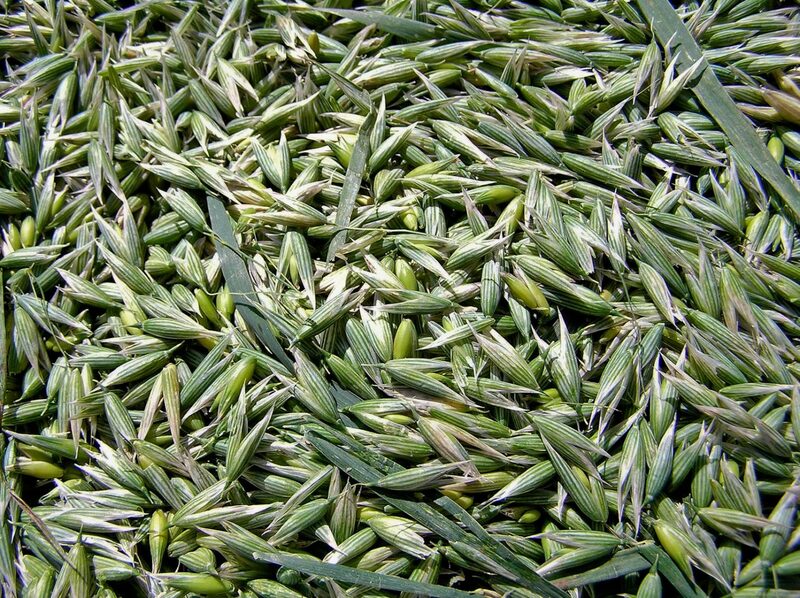 They have a hard outer shell containing a single seed. A good example is sunflower seeds, in which one has to open the outer shell to get to the single seed inside. Finding the plant is easy, it is very common. I also leave a section of my garden for burdock yearly. This plant is very hardy and will continue to return even if you cut it back numerous times. 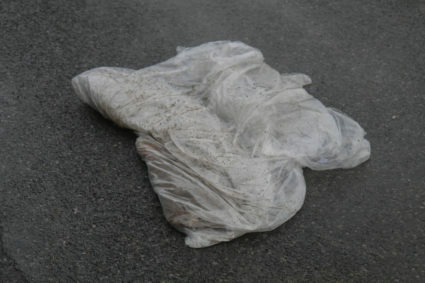 To gather it, wear non-sticky clothing such as a rain jacket. Most importantly, have your hair tied back and tucked away in a hat or scarf. If the barbs get entangled in hair they are very difficult to remove. 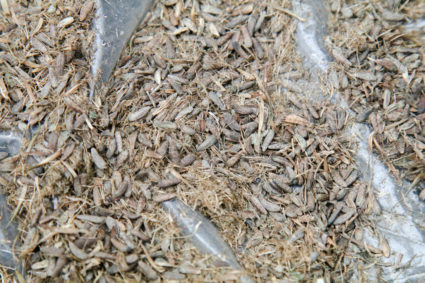 Gather the seed heads in late summer after they are mature and the seed heads are mixed green and straw-colored. Gather them before they get too weathered by rain. I store them in bags until I have time to process them. 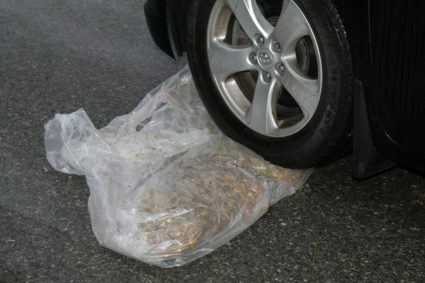 Burdock seed heads being crushed by a vehicle. Ithaca, NY. November 14, 2017. Burdock seed heads fully flattened after being run over. Ithaca, NY. November 14, 2017. Burdock seed head after being run over by vehicle. Ithaca, NY. November 14, 2017. Burdock seeds after being run over by vehicle. Ithaca, NY. November 14, 2017. Close up of Burdock seeds after being run over by vehicle. Ithaca, NY. November 14, 2017. Now begins the difficult part, wresting the seeds from the seed head and I had an idea I wanted to try. 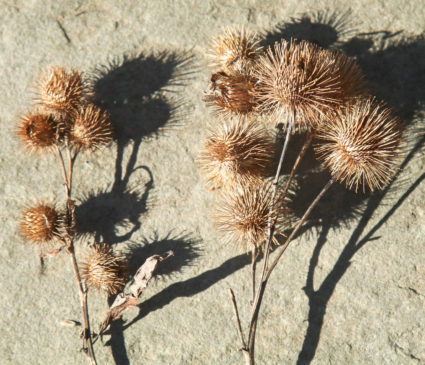 Many years ago while visiting Andrea and Matthias Reisen of Healing Spirits they told me they removed burdock seeds by running over the seed heads to loosen them up. And so that is what I did. I wrapped the seed heads in a thick plastic bag and drove back and forth over them until they were as flattened as they would get. I am glad that I live on a less traveled road, as I am sure this would seem suspicious to anyone passing by. I unwrapped the plastic bag and began the tedious task of pulling apart and garbling the crushed seed heads. 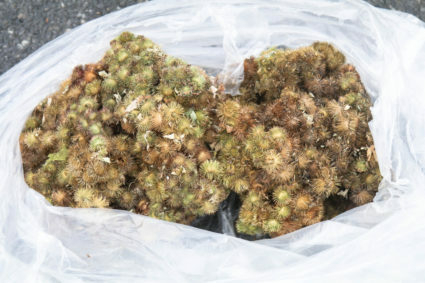 (Note-garbling is an old-fashioned word that describes the process of separating the parts of a plant you want and don’t want in the medicine.) Meghan, an apprentice who enjoys this type of meditative work, did the majority of the separating. She geared up by donning a facemask to avoid breathing in the irritating hairs as well as wearing rubber gloves and long-sleeves so they wouldn’t irritate her skin. I also lent her a jacket that I don’t wear often as the hairs can make for itchy clothing. We then waited for a windy day to help with the winnowing process. 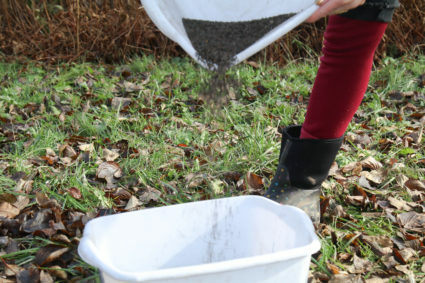 This was done by pouring the seeds and chaff from one container into another while allowing the breeze to blow the lighter chaffy hairs away. While Meghan was sorting through the seeds, she noticed that some that were clumped together had small creatures inhabiting them. They are the larval stage of the Burdock seedhead moth (Metzneria lappella), which overwinters and pupates in the seed heads. 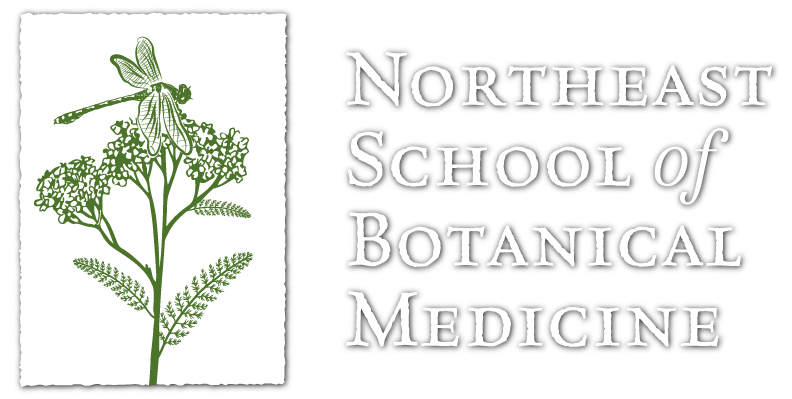 Personally, I want to have a broader understanding of the local medicinal plants. And being directly involved in the gathering, processing, medicine preparation and using these plants is an important part of my gaining this information. Burdock seeds have a longstanding tradition of being used for a number of ailments. I have focused on its application for chronic skin disorders. Many of the patients I see have persistent idiosyncratic skin conditions with no obvious cause or triggers. While these rashes may be diagnosed as eczema, psoriasis or other dermatitises, many do not respond to standard medications. These skin disorders are sometimes associated with other ailments such as fibromyalgia and autoimmune disorders. While it is a bit of a jump, it seems that burdock seeds may have therapeutic properties that help in alleviating these rashes working with underlying conditions and supporting overall health. The mechanism of these effects is not well understood, though they include antiinflammatory and antioxidant activity. There are a number of research papers often focusing on the lignan arctigenin that show how these effects may take place. Though as with many plants, we are a long way from understanding the underlying dynamics that give rise to their medicinal action. Burdock seeds are known for their diuretic (peeing) effect, which may also play a part in the seeds helping with rashes and other skin conditions. One possible mechanism is by increasing glomerular filtration. This involves filtering the blood through the kidneys, which may in turn help filter out compounds that increase white blood cell mobilization, which may irritate the skin. People may want to avoid taking this plant before sleep, due to this diuretic effect. 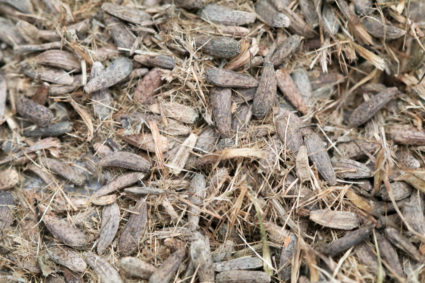 In general, burdock seeds are considered safe for internal and external use. But be forewarned, they are quite bitter tasting which may limit their use in some preparations. Occasionally skin conditions get worse before they get better. If you are using a burdock seed medicine and your rash becomes redder and/or more irritated, you may want to continue the treatment for a few more days to see if your symptoms lessen. If they don’t, or just feel the medicine is doing harm, stop right away. It is helpful to crush the seeds before preparing them as medicine. This allows the menstruum (the fluid used in the preparation) to penetrate the seed coat. A coffee/spice grinder works well for this purpose. 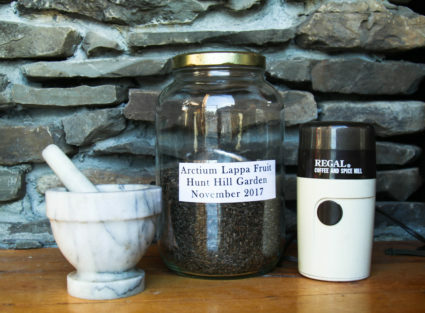 You can also use a mortar and pestle, though it may take some work to reduce them to powder. 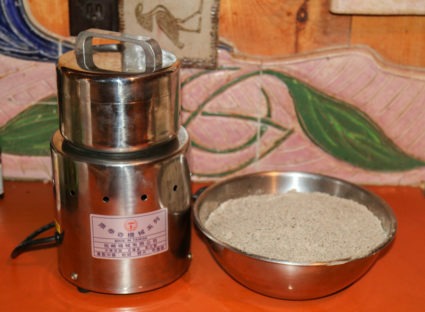 One more option is a powdering machine called the ‘Chinese grinder’ (see photo). They are expensive, but have more power for grinding seeds and harder plant material. They can also powder larger quantities at a time than a spice mill. The ratios below represent a menstruum: herb ratio. The menstruum is the liquid used. For example if a 1:4 ratio was used and you were using 6 oz of powdered seed, you would cover it with 24 oz of menstruum 6:24 (6×4=24). These medicines should be shaken regularly for about 2 weeks. Capsules-1-2 capsules, 1-2 times daily. If you are preparing your own capsules, powder the seeds just before encapsulating them. If you prepare a large batch, you can put them in a sealed container and keep them in the refrigerator to preserve their freshness. 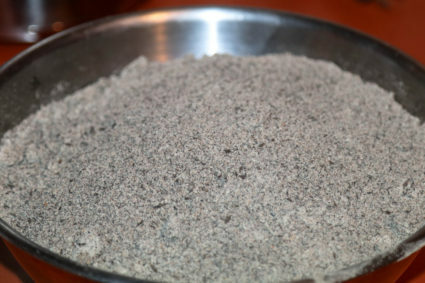 Preparation-lightly simmer the powdered seeds for 5 minutes. Use approximately 1 rounded teaspoon (.1 oz) in 1 cup (8 oz) of water. Strain through a fine mesh strainer. Dosage-this is a strong tasting bitter tea, you may want to add other herbs for flavor or water it down. This tea would also work as a medicinal bitter. Drink ¼- ½ cup 2 times daily. If you make a larger batch, the rest can be refrigerated for later use. If you have a sensitive stomach, you may want to start with a smaller amount. Powder-Stir approximately ¼-1 teaspoon in 1 cup of water or beverage of your choice. You may want to follow with a chaser. Dosage ½-1 dropper (1-2 ml), 1-3 times daily. Preparation-At a 1:4 ratio, pour extra virgin olive oil over the powdered seeds. Use a cloth as a lid to allow the medicine to ‘breath’, except when shaking the medicine. 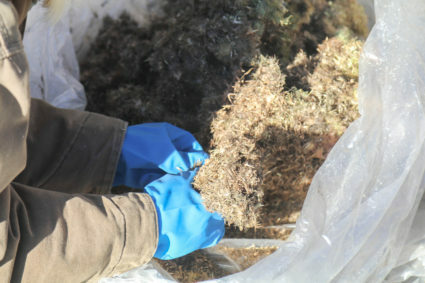 The cloth can be replaced with a lid when the oil is strained. Dosage-apply 1-3 times daily on top of the skin. Oils can be messy, it may help to apply a cloth or sports bandage on top of the oil to prevent clothing from getting untidy. Finished products. Burdock seed tincture on the left and Burdock seed oil on the right. November 29, 2017.